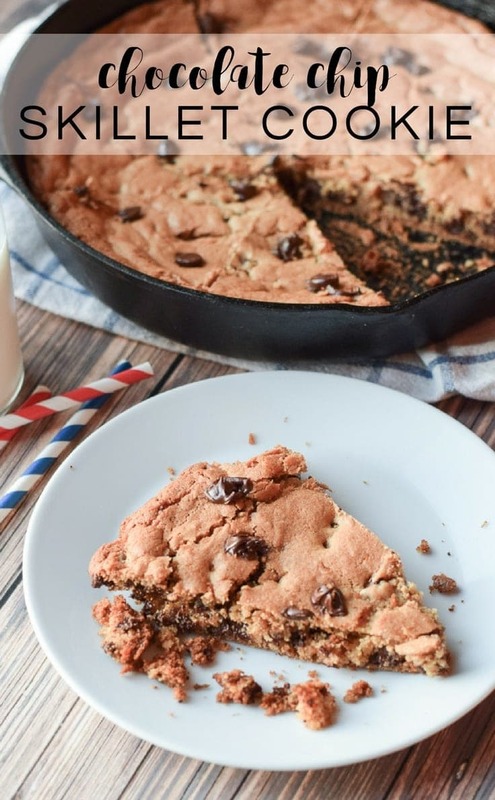 This skillet cookie recipe is a simple dessert recipe that’s quick to throw together for an after dinner treat! Top it with some vanilla ice cream and you have a yummy homemade dessert that the family will love! Hi there! 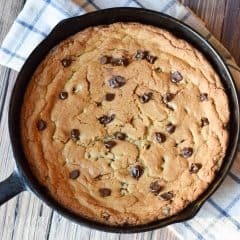 It’s Kelly from Typically Simple and I’m back this month with another yummy dessert recipe to make a giant chocolate chip skillet cookie! If you’ve been checking out some of the other recipes I have shared in the past, then you know that I’m all about the simple desserts! If a recipe calls for some basic ingredients and can be prepped in about 10-15 minutes, then sign me up! And this skillet cookie recipe is definitely basic and simple, but it is also oh so yummy! It’s a fun twist on classic cookie bars because it’s made in a skillet. Serve it up with some vanilla ice cream and you have a quick & easy dessert for parties or family get togethers. This was the first time I’ve made dessert in a cast iron pan and it definitely will not be the last! But if you do not have a cast iron skillet, this recipe can be just as easily made in a baking pan. The thing that makes these so easy is that you are cutting out the time it takes to roll out individual cookies. 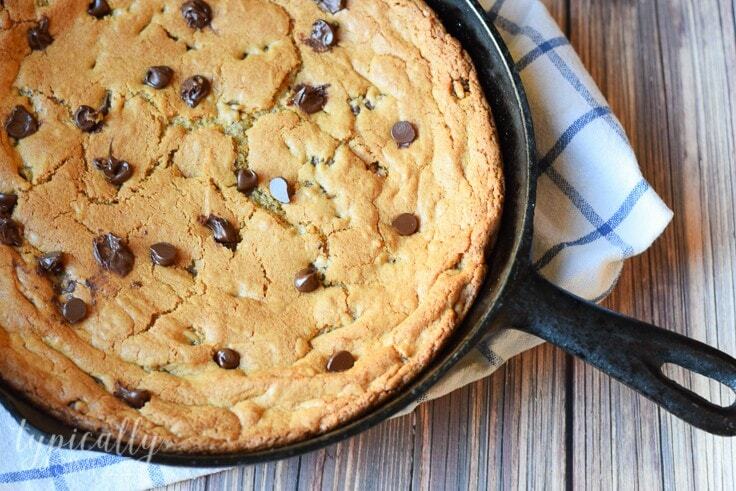 Just put the entire bowl of cookie dough in a skillet and bake! Easy! Mix together butter, sugar, and eggs in a large bowl. Stir in flour, baking powder, and salt. Combine all ingredients well. Spread batter into a well greased skillet. Bake for 25 minutes or until edges are golden brown. Allow pan to cool slightly before cutting into slices. How do you “fold” in an ingredient? I’ve been asked about my folding technique. Here’s an easy way to understand how to fold something in and why you do it. The key is gentleness. Use a rubber spatula and gently incorporate the chocolate chips into the dough. Avoid over mixing. Scrape the sides and the bottom and mix just enough to make sure the chips are spread throughout the dough. Why do you fold instead of mixing ingredients? This is because you already have a perfect dough and you don’t want to introduce more air into it. How easy is that for a yummy dessert recipe?! And even better is that each slice of skillet cookie has a crispy edge and gooey soft middle. I might even add some more chocolate chips next time to make this an extra chocolatey treat! Here is a printable recipe card for you. Enjoy! 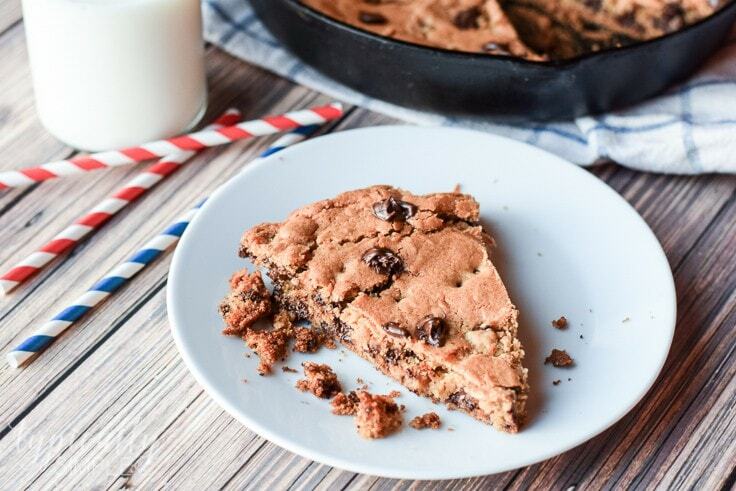 This skillet cookie recipe is an simple dessert recipe that's quick to throw together for an after dinner treat! Top it with some vanilla ice cream and you have a yummy homemade dessert that the family will love! In a large bowl, mix together butter, sugar, and eggs. Stir in flour, baking powder, and salt, combining well. This skillet cookie is best when served still slightly warm from the oven, however you can serve it later. Just make sure to cover it tightly with plastic wrap or foil to keep it soft until it’s time to eat it! Originally posted May 2018, Updated October 2018.